Short and sweet, Believe is much deeper than the four songs you see on the surface- this one’s a juicy listen and you’ll find yourself trapped and hypnotized for hours when you turn it on. There’s just enough pop-style, if that’s what you dig, but there’s also just enough rock to keep that crowd happy too. 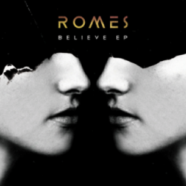 The electronic rock vibes provided by Romes are intoxicating and will entice you to the point you don’t wanna turn back- and you won’t. Romes aren’t afraid to throw it all out on the table, bear their hearts and souls- and it’s all for the benefit of the listener- that’s what sets Romes apart from the rest of the pack. The music is real, the lyrics are from the heart and the band is out to set the world on fire. Believe is the perfect way to make a mark and an indent on the music world. If their next effort is anywhere as strong as this one, we can look for Romes to become one of the big names in the music world. Look for big things from them in the near future. They’re her to stay.